Welcome to the Artistic Outpost Design Team April Blog Hop! Each month, the fabulous designers at Artistic Outpost showcase projects created with various Artistic Outpost Plates/Themes, this months DT Blog Hop theme is Designers Choice. If you are a fan of Artistic Outpost, I'm sure you read the email from Robyn last week, or this message posted on the Artistic Outpost Facebook page. With over 354 projects on my blog featuring Artistic Outpost plates, it's no secret that I LOVE creating with Artistic Outpost images, and I am excited for the plans and expansion of the Artistic Outpost brand under the new ownership! Be sure to read the Press Release here for more details! For my project, I created a Mixed Media card using the Artistic Outpost Think and Wonder, Generation Redux, Happiness and Paperboy plates. To create the background panel, I applied DecoArt American Multi-Surface Satin Acrylic Paint in Poppy, Costal Waters and Orange to my Gelli Arts Plate, then added the Dots Stencil from Just a Trace and some Punchanella to the plate, and made a print onto Mixed Media Paper. After the background panel was dry, I dry embossed it with a piece of Punchanealla for added texture, then stamped the images in Ranger Black Archival. The sentiment, butterfly and children are all stamped on Mixed Media paper then adhered to the printed background using DecoArt Decou-Page. Looking for more inspiration using Artistic Outpost images, be sure to stop by the other Designers Blogs to see what they created! 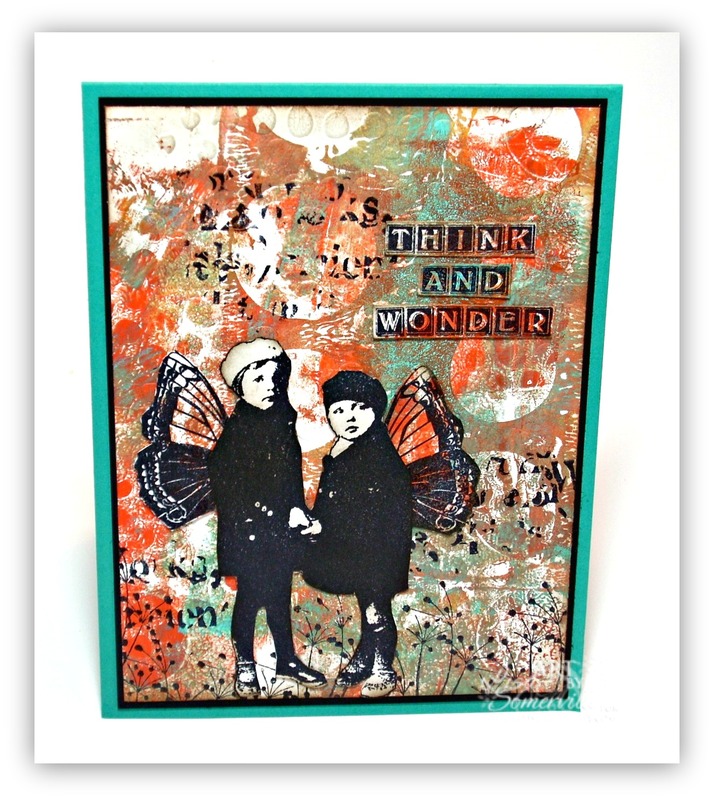 Another gorgeous Gelli background, and I adore the added wings on these two - lovely card, Lisa! Wowza GF! Stunning! Placing an order for those backgrounds! Fabulous Gelli print background, Lisa! Love the butterfly wings added to the girls! Beautiful card. Have fun. What a wonderful background you created with your Gelli plate Lisa! I really need to practice with mine! love the stamps you used on this wonderful card! Beautiful background you've created with the Gelli plate . Wonderful BG Lisa and your card is gorgeous as always. I am amazed at the fabulous array of backgrounds that you come up with from that gelli plate. Beautiful and artistic card, Lisa. Yummy colors and layers of texture in your background and of course your sweet children are fabulous! Such gorgeous colors and wonderful textures in your background, Lisa! Love the darling kiddies with the wings!